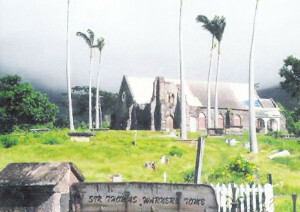 Chapter Project: Restoration of the St. Thomas Anglican Church Cemetery, St Kitts, Caribbean. The cemetery is being restored through a foundation established by our fellow dame Lisa Hebert Lents. Our chapter has conducted numerous fundraisers to help support the foundation. The cemetery is the final resting place for many of our Colonial Ancestors, including Sir Thomas Warner (of whom Lisa is a descendant), Samuel Jefferson, Sir Charles Payne, Dr. John Hutchinson and wife, Mary Markham Hutchinson, Captain John Pogson and Colonial John MacArthur and family.